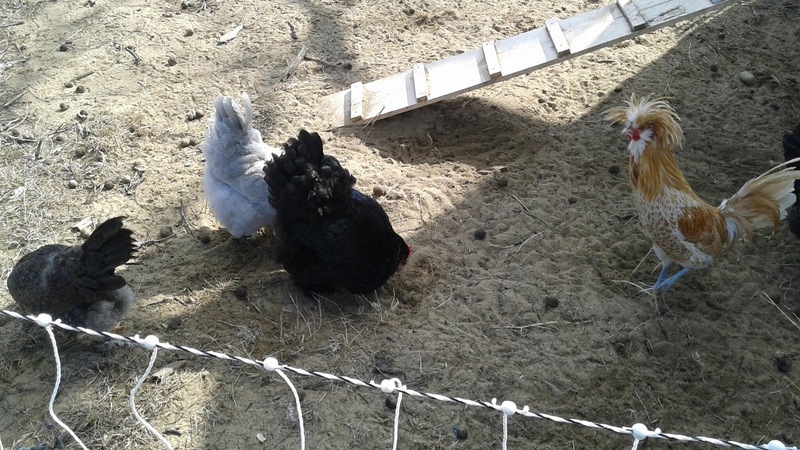 Two weeks ago I put Joe and Princess Diana in the big coop with the three older girls. I moved them on a Friday night so when they woke up they would just be there. Moving them at night they can't see in the dark well and will just sit on the roost until it gets lighter out. Well I didn't think about the automatic door opening in the morning, so when I got up early to feed the dogs and looked outside, I saw Joe and Princess Diana outside in the fenced in area. When I walked over to the coop I discovered Princess Diana was actually on the other side of the fence! She flew over the fence but was staying close to Joe. I was able to catch her and put her back. Later when I looked out to check on them, the older girls were outside too, and they were chasing after Joe and Princess Diana. Joe was trying to crawl through the electric fence to get away from them! I decided this was not going to work, there was no way Joe and Princess Diana were going to go back in the coop at night. They needed to be lock in to work it all out. I gathered everyone into the coop and closed them in! Boy oh boy! They made so much noise you would have thought they were tearing the walls down! I went to check on them a couple hours later. Princess Diana was hiding in one of the nest boxes and I could not see Joe anywhere. I asked the older girls if they ate him! A while ago I had a problem with the girls laying eggs in the corner of the coop so I wedged a cardboard box in the corner between the wall and the roost to keep them from laying eggs there. They had since pecked and ripped the box up a bit and sure enough Joe was hiding inside it! Queen Ann was even sticking her head inside to peck at him. So I took the box away. Poor Joe, he ran to corner and stood there, If he can't see them, they can't see him! Wrong! Queen Ann and Lucille were giving the new ones a very hard time, but that is way it is! A little later I went in the coop and picked up Queen Ann and Lucille and held them for a good 30 minutes to let the young ones have a slight break to get some food and water. I also hung a cabbage in the coop to distract the older girls a bit. Now I don't want you to think that sweet Laverne was innocent during this time. She was staying out of Queen Ann and Lucille's way, cause she is used to being low girl in the pecking order. But when I was holding the two girls, Laverne was getting her pecks in to let them know she was higher in the pecking order than they are! But at least she didn't go out of her way to chase them around. Every night I have to go out and move Joe and Princess Diana off of the nest boxes and onto the roost. After two weeks you would think that they would figure this out. I'm thinking of blocking off the nest boxes a little before dusk, but then I would have to go in and remove them in the morning. I don't know if that would force them to get on the roost at night or if they would just huddle on the ground. Joe does not stand facing the corners anymore and Princess Diana does not hide in the nest box, too much. In fact Joe has gone back to attacking me, like a bad rooster! I have to keep my eye on him all the time. Queen Ann still will go out of her way to peck at them but she is top girl so she will always let them know this. 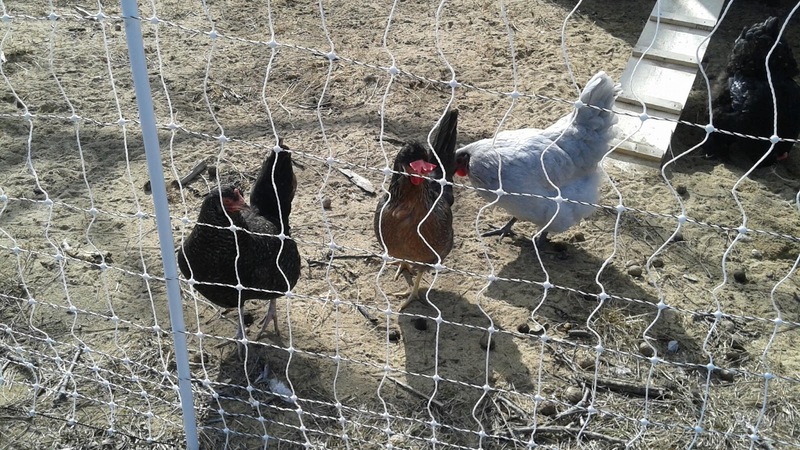 After two weeks of being closed up together, I opened the chicken door to let them out in the fenced in area. They all enjoyed being outside and everyone was in the coop at night. Still not on the roost of course but at least in the coop!